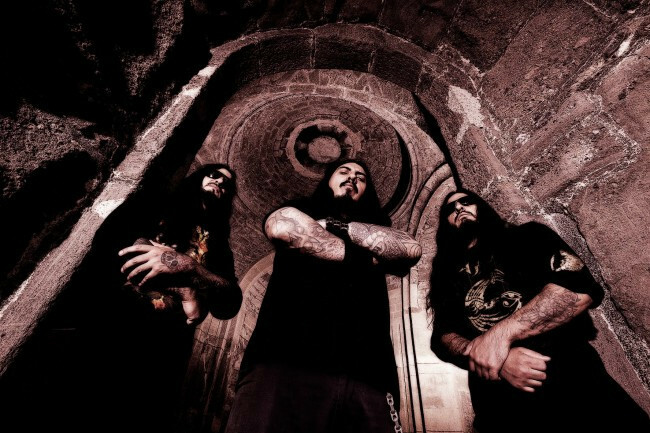 Krisiun’s eighth studio album, The Great Execution, was one of the best death metal albums of 2011. As Phro wrote in our review, “This album goes to war and it doesn’t bother with prisoners or survivors . . . . It’s the distinctive sound of flaming swords and armor crashing as the Morning Star leads his army against the Throne on the Plains of Heaven.” It’s a dynamic, diverse, endlessly listenable album that has lost none of its potency in the year since its release. Yesterday we kind of made our own music video for the album, matching the song “Blood of Lions” to slow-motion film of one of nature’s most magnificent predators going flat out. Today, we give you the premiere of an official Krisiun video. This time the song is “The Will To Potency”, and this time the predators are those três irmãos from Brazil. Blending footage from live performances with scenes of the band surrounded by death in the high desert of New Mexico, the imagery of the video matches the supreme bad-assery of the song. Right after a great acoustic guitar intro by guest guitarist Marcello Caminha, “The Will to Potency” starts in the pace of a war march, and then explodes into pure speed and brutality. The roaring vocals shout words of fury and defiance over an epic main riff, and the lead guitar brands the song with fast sweeps and arpeggio picking, raising shades of the band’s debut album, Black Force Domain. The music hunts, and it kills. The Great Execution is out now on the Century Media label and is available wherever eviscerating death metal is sold. Watch the video below, and bow down. The frantic camera movement and the constant cutting back and forth between the scenes fit the music really well, but honestly it gave me kind of a headache.